Turmeric or Curcuma longa has been used for 4,000 years to treat a plethora of diseases and conditions ranging from inflammation to indigestion to infections. Curcumin, a substance found in turmeric, is a potent antioxidant, according to the University of Maryland Medical Center. While generally regarded as safe, some people may experience unpleasant side effects from turmeric. Always talk to your doctor before taking herbs for medicinal purposes. The UMMC says curcumin has been suggested to prevent, manage and possibly treat a number of cancers, including breast, colon, prostate and skin cancers based on test tube and animal research. Turmeric may also help prevent the accumulation of plaque that can obstruct arteries and lead to heart attack or stroke. 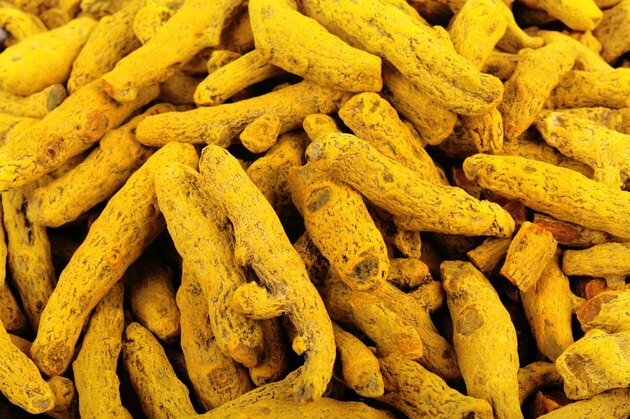 Animal research found an extract of turmeric helped improve cholesterol levels, according to the UMCC. It's uncertain whether the same effect would occur in humans. Curcumin shows promise as an herbal remedy for an inflammatory eye disorder called uveitis, according to a review in the January 2013 issue of the "American Association of Pharmaceutical Scientists" journal. The journal also reports that curcumin is beneficial in treating other conditions such as heart disease, Crohn's disease, pancreatitis, ulcers, psoriasis, diabetes, acute liver conditions and hepatitis. Turmeric may also ease osteoarthritis symptoms due to its ability to decrease inflammation. However, the UMCC says further research is needed. The National Center for Complementary and Alternative Medicine.Turmeric has also been used to improve digestion, liver function and help regulate menstruation. Liver toxicity and stomach upset are possible when recipients take turmeric in large doses or for extended periods. The University of Pittsburgh Medical Center warns people with liver disease to avoid taking turmeric. Diabetics should use extra caution before taking turmeric since it can lower blood sugar levels.Turmeric also may interfere with blood-thinners such as aspirin, warfarin, brand name Coumadin, or clopidogrel, sold as Plavis, and may affect the blood's ability to clot, cautions UMMC. Turmeric may also interfere with antacids including famotidine, brand name Pepcid, and ranitidine, sold as Zantac. Although turmeric is used for a variety of ailments scant reliable evidence exists to support its medicinal effects. Talk to your health care provider about the potential benefits and risks of turmeric and curcumin. Can Turmeric Affect Your Blood Pressure?